Happy Valentine's Day...Wikipedia says that this day, February 14 is an annual commemoration to celebrate love and affection between intimate companions. I think most men hate this day because they have to impress their partners with romantic dinner and bouquet of flowers and will usually cost them a lot of money. On the other hand, it might be worthwhile spending the money to avoid any disappointment, bad memories and future unexplained nagging...speaking from experiences...LOL. I was happily packing these shortbread into my husband's lunch box and he was happy too telling me all positive feedback about this sweet treats... Nice to know this. This is the inside of a non-drizzled shortbread. As you can see, it has a great crumbly texture. I have reduced the recipe proportional to make 20 of 4cm x 4cm heart shortbread. Using an electric mixer, beat butter, icing sugar and vanilla until light fluffy. Add flour and almond meal. Stir until combine. Turn dough onto lightly floured surface and knead until smooth. Refrigerate for 20 min or until firm. Roll out dough to 5mm thickness and cut into shapes. Brush shortbread with egg white and bake for 20 min or until light golden brown. Allow to cool completely on tray. Mix both chocolate and cream together and microwave them in low power until the chocolate melts. Allow the ganache to cool to room temperature and apply onto one side of the shortbread and sandwich another one on top of the ganache. Place the sandwich shortbread on a wire rack or baking paper. Using a microwave in low power, melt dark chocolate and drizzle on top of the sandwich shortbread. Allow chocolate to set. oh my the texture is wonderous Zoe!! can i have a piece please! They look so cute! They remind me of the milano cookies, do they taste like that? Would you mind describing the texture to me? Those cookies are so pretty, it's no wonder that your husband raved about them. :) I think Valentine's day for me is just a time to share your love with people (friends and maybe people you don't know). Maybe doing one or two kind acts... at least I hope I will do something this year. Happy early Valentine's day! Those are mouthwatering photos, looks incredible! It seems like it is always the ladies who are fretting what to give their guys for VD....haha..this looks delicious, perfect if your hubby has a sweet tooth! Your cookies are gorgeous! I love shortbread, and with chocolate? Delicious! I love the look of these. 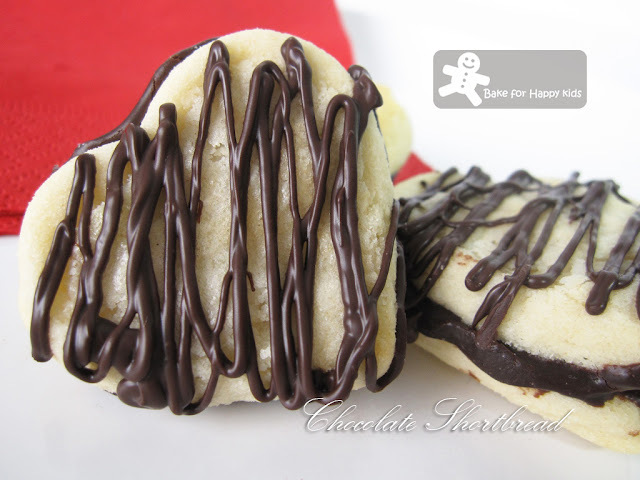 Gorgeous dark chocolate all smashed between sweet shortbread like cookies. Oh man, I'm making myself hungry. WOW! this is very pretty, please pack some in my lunch box too! Gorgeous cookies. I'll take a dozen of them please. What cute little cookies! I definitely love the heart shapes! Zoe, you must have melted your husband's heart, you are such a lovely and dearly wife, you are so sweet as the chocolate shortbread! i love the drizzled on chocolate over these shortbread, looks simply irresistible! These cookies look beautiful! I can see they are soft and melt in their mouth! These look positively delectable! What a sweet lunchbox treat! What a lovely, thoughtful surprise for your husband! 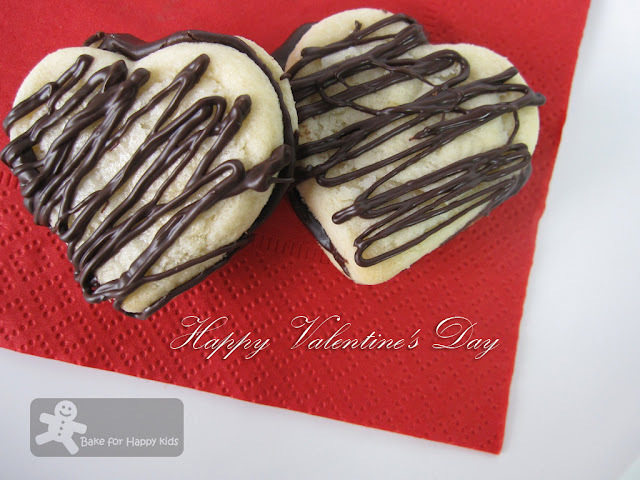 Wow, what a wonderful romantic shortbread! Specially made with love for someone you love, it couldn't get any sweeter than this! I am still undecided of what to bake yet! (I have ran out of butter actually!). Have a Happy Valentine Day to you and your loved ones! Zoe, what a nice lunchbox surprise for your husband. 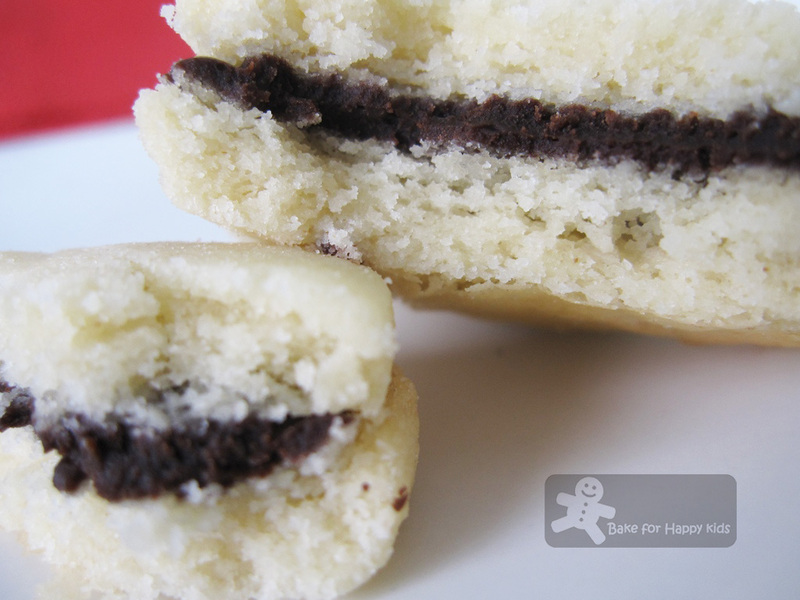 The cookies are so decadent with the ganache filling. Oh my goodness, I thought my dessert was decadent! This looks delicious! Thank you for sharing!